Well hello there! So thrilled you have joined me. Starting this blog is a new adventure for me. I fell in love with farmhousy, country, cottage style decor about ten years ago, and decorating has become my passion. My style has evolved over the years, and just in the past couple years I feel as though I have come to define what I truly love. Finding your style is a process, and it really does take time. At this point I would call my style Modern Farmhouse, as I do like a little bit of new mixed in with the old. There is something about the combination of the two that is just refreshing. And lots of white trim and millwork is key. It’s the perfect foundation on which to build a perfectly imperfect modern farmhouse room. I’ll be sharing more of my thoughts along this journey, but right now I would like to just jump right in and share our latest room makeover–our master bedroom. After several years of putting off our bedroom for other projects, we decided it was time to make it a priority and turn it into a space we both love. I am going to start by saying (and I will say it again and again I’m sure) that I am blessed with a very handy husband. He seriously can do anything when it comes to home renovation, and if he hasn’t done it before, he figures it out! I admire his skills so much and my ideas would never come to life without him. You could say we make a great team. Here is our finished bedroom–a combination of my styling and his DIY expertise. It turned out better than I had envisioned, and it is now a space where we can just relax and shut out the world. The shiplap accent wall my husband added is the perfect backdrop for our farmhouse bed, which we purchased at Target. Oh shiplap! I have been in love with shiplap before I even knew it was called shiplap! I remember wanting a “planked wall” ten years ago, and then when I started watching Fixer Upper I was floored to learn that Joanna also loved that look. I absolutely LOVE JoJo by the way (who doesn’t? )–she has been my biggest inspiration so far. You can see what reading material I chose to set on my nightstand! As far as bedding goes, I wanted something cozy and neutral. I chose Ikea’s grey and white ticking stripe duvet cover, and the pretty black and white floral quilt and shams from Wayfair. I love mixing and matching bedding with different patterns yet similar colors–it gives so much visual interest. I also incorporated the khaki colored pillows with the tan cable knit throw at the foot of the bed to complete the neutral palette. The knit throw also adds a little coziness and texture to the bed. I ordered that sweet sign above the bed from Smallwoods, a shop out of Texas that has a large variety of signs at very reasonable prices. You can even customize your own, which I did with some lyrics from a country song I love. I already had our vintage dresser for several years, and it fits in perfectly. I styled the top with a few antique finds and an old framed mirror that was originally painted but recently stripped down to its original beautiful wood patina. The natural wood contrasts beautifully with the creamy white paint. I love stacking baskets both for visual interest and functional storage, and these ones look great next to the dresser. I find most of my baskets at local antique shops and stores like Marshalls and Home Goods. The lidded baskets are best for stacking. This sweet old chair was an antique shop find. I thought about painting it, but the look of the raw wood is just too beautiful. I love the intricate carvings and the all the spindles. Too cute! I added the slipcovered chair, which used to be in our family room, to this small corner. It makes a great little reading nook. The old trunk at the foot of the bed was an antique show find, and it provides lots of storage for keepsakes. The chunky ivory jute rug I found at World Market adds texture and warms up the floor. Well, there you have it–our farmhouse bedroom. Oh I almost forgot! I found that sweet crystal chandelier here. I have always planned on hanging one in our bedroom, and it gives the space a romantic feel. The beaded ceiling medallion really makes the chandelier a stunning focal point. Well, thank you so much for reading my very first post! I hope you enjoyed it and found some decorating inspiration to use in your own home. I would love to hear from you–please share your thoughts and questions with me! God bless–until next time! Love, love, love your first blog post and your charming and beautiful master bedroom! All the different pieces, textures, colors perfectly come together in a stunning way. Thank you my sweet cousin!! Great job. Very sweet space. I love your style and attention to detail. Excited to see what you will post next! Just saw this on Pinterest and I’m in love! I’ve been wanting a new look for our bedroom and I am totally going to copy you. 😊 Where did you get the pillows and throw on the bed? Hi Jordan! So glad you love it! 😊 The little white throw pillows I purchased at Target a while back, and the khaki pillow covers came from Ikea. They came with a matching quilt called Alina. The floral shams came with the Laura Ashley set from Wayfair—the link is in the post. I ordered the throw from Amazon—it is the Batillo Inc. cable knit throw—not sure if they still have the tan color available. I hope this helps—thanks for the sweet comment! Hope you’ll be back! – may I ask where you got the bed from? Thank you Valerie! We purchased the Tilden metal queen bed from Target. So cute! Where did you get the nightstands at? I’ve been looking for a small pair like that. Thanks Britainy! The nightstands aren’t actually matching, but the one visible in my post was a hand me down from my grandparents a long time ago and I painted it white. I believe they found it at a local department store. You could probably find similar styles at Target, Home Goods, or Wayfair. Thanks for visiting my blog! LOVE this bedroom!! I have a white ship-lap accent wall as well and I’m currently trying to find that perfect gray color for the walls. What is the name of the color you used on your walls?? Thanks!! Hello! I am obsessed with this room! Where did you get the lamps from? Love this look! What did u use to create the ceiling detail? Hi Nina! Thank you—glad you like it! The coved/inset ceiling was already there when we purchased our home. I ordered the ceiling medallion from Lowe’s. Hope that helps! Let me know if you have any more questions and thanks for visiting my blog! In love with your room. So glad I found your blog. 🥰 Where is the sheet set and bedskirt from? I’m in love with this room! I’m using it as my guest room inspiration 😍 Can you tell me what size width you used for your shiplap wall? Is it 7”? Thanks! Hi! Thanks so much! Sorry for the delayed response—I haven’t been checking in with my blog much, as I have decided to focus on my Instagram account. 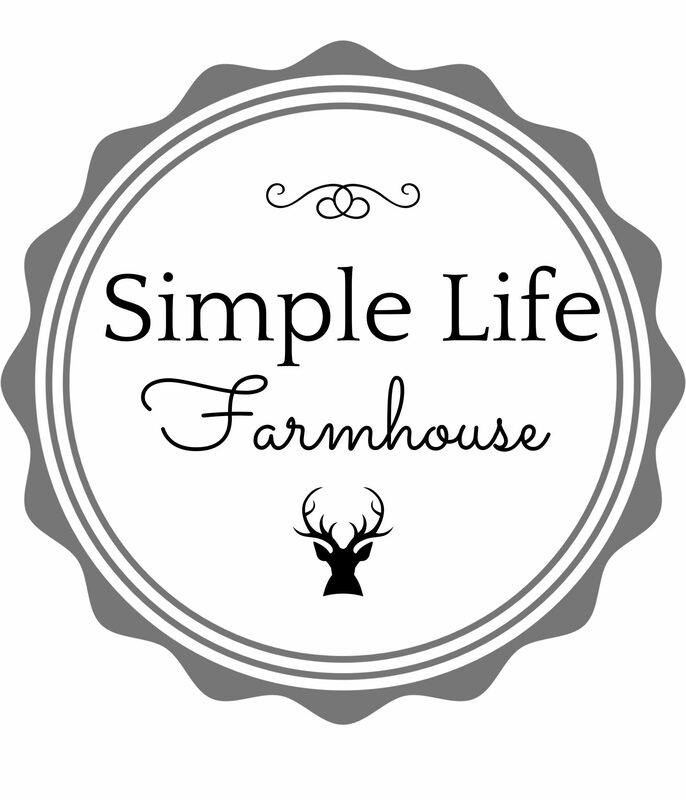 Hope you’ll follow me there at simplelifefarmhouse, where I post nearly every day. The shiplap we used is 6” wide. So glad you have found some inspiration in our bedroom—have fun creating your own cozy space! I just recently saw your bedroom pictured on Pinterest- I am making some changes to our bedroom- I just purchased a bed like yours & then saw the pic & really like the bedside lamps- I read where you said they are the Adair lamp at Pottery Barn- I’ve checked online & only see the floor lamp option- It’s saying that the table lamp is no longer available- how long ago did you purchase the lamps? Did you purchase them in a Pottery Barn in your area? If so, do you know if they still have the table lamp in stock? Thank you, in advance, for your time & help with this. Hi!! I purchased those lamps about four years ago—I’m surprised they don’t sell the table lamp anymore! Check Wayfair or Amazon, I bet you could find something similar. Good luck in your search!